You know you're supposed to drink plenty of water, but sometimes it's just ... so ... boring! Fancy up your H2O with fun and fanciful flavors. 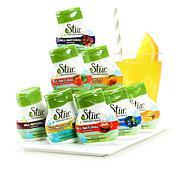 "Stur" in a little or a lot to make each refreshing beverage as strong, sweet or subtle as you like. Cheers! TEA + LEMON Nutrition Facts: Serv. Size: 2ml (1 squeeze in 8oz water), Servings: approx. 20, Amount per serving: Calories 0, Total Fat 0g (0% DV), Sodium 0mg (0% DV), Total Carb 0g (0% DV), Sugars 0g, Protein 0g, Vitamin C 100%. Not a significant source of Fat Cal, Sat Fat, Trans Fat, Cholest, Fiber, Vitamin A, Calcium, Iron. Percent Daily Values (DV) based on 2,000 Calorie diet. Contains 0% Juice. 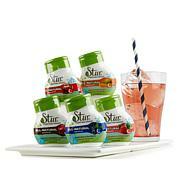 INGREDIENTS: Water, Natural Flavor, Brewed Black Tea, Citric Acid, Ascorbic Acid (Vitamin C), Natural Stevia Extract. POMEGRANATE CRANBERRY Nutrition Facts: Serv. Size: 2ml (1 squeeze in 8oz water), Servings: approx. 20, Amount per serving: Calories 0, Total Fat 0g (0% DV), Sodium 0mg (0% DV), Total Carb 0g (0% DV), Sugars 0g, Protein 0g, Vitamin C 100%. Not a significant source of Fat Cal, Sat Fat, Trans Fat, Cholest, Fiber, Vitamin A, Calcium, Iron. Percent Daily Values (DV) based on 2,000 Calorie diet. Contains 0% Juice. FRUIT PUNCH Nutrition Facts: Serv. Size: 2ml (1 squeeze in 8oz water), Servings: approx. 20, Amount per serving: Calories 0, Total Fat 0g (0% DV), Sodium 0mg (0% DV), Total Carb 0g (0% DV), Sugars 0g, Protein 0g, Vitamin C 100%. Not a significant source of Fat Cal, Sat Fat, Trans Fat, Cholest, Fiber, Vitamin A, Calcium, Iron. Percent Daily Values (DV) based on 2,000 Calorie diet. Contains 0% Juice. STRAWBERRY WATERMELON Nutrition Facts: Serv. Size: 2ml (1 squeeze in 8oz water), Servings: approx. 20, Amount per serving: Calories 0, Total Fat 0g (0% DV), Sodium 0mg (0% DV), Total Carb 0g (0% DV), Sugars 0g, Protein 0g, Vitamin C 100%. Not a significant source of Fat Cal, Sat Fat, Trans Fat, Cholest, Fiber, Vitamin A, Calcium, Iron. Percent Daily Values (DV) based on 2,000 Calorie diet. Contains 0% Juice. ORANGE MANGO Nutrition Facts: Serv. Size: 2ml (1 squeeze in 8oz water), Servings: approx. 20, Amount per serving: Calories 0, Total Fat 0g (0% DV), Sodium 0mg (0% DV), Total Carb 0g (0% DV), Sugars 0g, Protein 0g, Vitamin C 100%. Not a significant source of Fat Cal, Sat Fat, Trans Fat, Cholest, Fiber, Vitamin A, Calcium, Iron. Percent Daily Values (DV) based on 2,000 Calorie diet. Contains 0% Juice. I have had migraines headaches since I was a teenager many decades ago and spend much time reading labels so as to avoid all known triggers ! 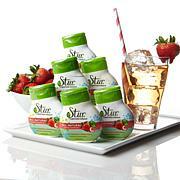 Stevia is the only weight control sweetner that is safe and this product uses it !! !Love them !!! I have been looking for a product to "brighten" my daily water intake without all of the artificial preservatives and chemicals. This is it!!! 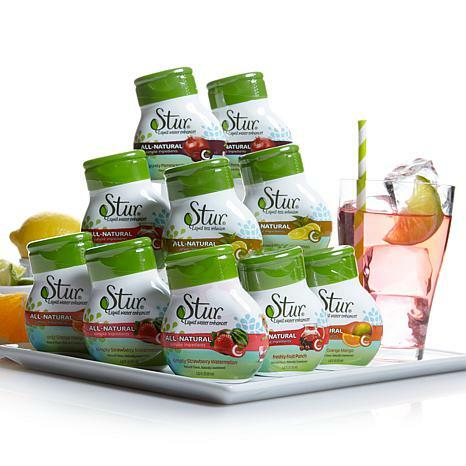 I can add just the right amount of Stur to my water. Even works great with my Sodastream carbonated water! Will be very refreshing in the summer! 5 stars!! While I am enjoying the actual product, I have had much difficulty in opening the individual packages. One even leaked during shipping. The plastic is extremely tight and the perforated part is not really perforated enough to allow easy removal of the plastic. Also, once you get the plastic to come off the lid, it is all one piece over the entire product and as the plastic contains the contents information, you must be careful to not remove all of it. There not bad, but to small for the price. Hard to open, one was leaking in box. While the concept is good it takes too much product to get the taste. It's a pain to open. I'll keep it but not worth the price to me.